The briefing was attended by FC Shakhtar CEO Sergei Palkin, the Rinat Akhmetov Humanitarian Centre Director Aleksandr Vishnyakov and the Humanitarian Centre Coordinator Rimma Fil. 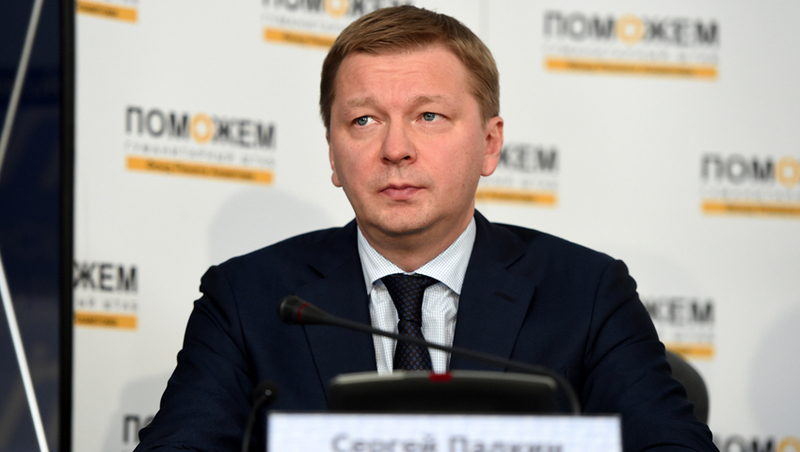 - Speaking about the Donbass Arena, at the moment all entrances and exits are blocked by the armed men, - Sergei Palkin told about the current situation around the club infrastructure. - Technical staff and office personnel also do not have the possibility to get to the stadium. Access is allowed only to those on duty shift. The role and objective of the duty shift is preventing emergency situations, if any. You perfectly understand why only those people are allowed access to the Donbass Arena. Also, on February 28, armed men entered the territory of the STB Kirsha, brought all the employees out, sealed the entire property, buildings and facilities, put their guardsmen, and currently the base is fully under control of the armed people. Speaking about the infrastructure of the Football Academy, which is currently based in Donetsk, there are about 200 boys training there. There have also been repeated attempts to contact our people working at those facilities, on the part of the self-proclaimed republic with the aim of somehow influencing the operation of those facilities. Fortunately, everything is fine so far. The children continue to train. But if they exert pressure on our work processes, of course we will be forced to suspend the training process. - There was information that as a result of recent events in the Donbass Arena, they switched on the lights and spotlights. Is this information true? What does it mean? How can you comment on that? - It’s not difficult to put on the lights at the Arena. And anyone can do that. It was much more difficult, perhaps, to build it. Who built it, with what kind of love, and how much heart put into it - this, believe me, is known and remembered not only in Donetsk, the Donbas and Ukraine. The whole of Europe and the whole world knows the name of that man. Pressing the button and turning on the lights is not a victory, it's just nothing, it's ridiculous. The Donbass Arena was truly shining when it was filled to capacity by fans, when Shakhtar played and won there. And it will shine again only when, just as in the past, Shakhtar play there against the best clubs in the world for their fans. When the Champions League theme song sounds there. So far Shakhtar are not at the Donbass Arena, so it does not shine. And it won’t shine until the club returns home. And the things currently happening in Donetsk does not bring any closer, but instead makes more distant the fans of Shakhtar and those hundreds of thousands of people who have been expecting the team to come home. - How do you see the development of the situation and the future of FC Shakhtar? - The club president is so fond of Shakhtar that I don’t think any issues will stop his support. There were many tough moments. Very tough, the ones happening these days. But he has always been with Shakhtar and supported the club in every difficult situation. I think Shakhtar is the last outpost, which we can assume to be questioned in some way. - You said that only the people on duty shift have access to the Donbass Arena. Have you talked to those people? What's going on there, are there any emergencies taking place? - At the moment there is no emergency. The armed men just make an inventory of the property. And that's it. - What will happen to the kids attending the Football Academy in Donetsk? - I hope we do not get to the situation when it will be necessary to interrupt the training process. Everyone should understand that those are children. If we do not support them (that’s both moral and psychological support for them these days), then it will lead to nothing good at all. And not only we, but everyone performing those illegal actions, should think about that. - The Humanitarian Centre is the major humanitarian mission operating from the very first days of the armed conflict in the East of Ukraine. This is the personal initiative of Rinat Akhmetov, his personal pain and his desire to help his fellow countrymen. He feels them, he understands with his heart what's going on, he’s been helping them to survive from the first days on. We evacuated people, helped the wounded children and were busy dealing with rehabilitation. And the unspoken motto of ‘Helping people to survive’ in fact reflected the past and the current situation. For two and a half years of operation of the Humanitarian Centre, Rinat Akhmetov has saved 1,145,000 people. This is the exact number of people who have received some kind of assistance from the Centre. - On February 28, armed men blocked the operation of the Humanitarian Centre at the Donbass Arena and of all distribution points. All in all, that’s 28 stationary points, where people came to receive aid. To date, we do not know what happens to our property, we have no access to the aid. The distribution points are sealed. At the time of blocking the operation of the Humanitarian Centre, there were about seventy thousand survival kits for adults and children at the Donbass Arena. We have absolutely no access to undertake further activities aimed at distributing the kits to people. The ‘Arena of Mercy’, as it was called by Donetsk residents, is a vital element of the Humanitarian Centre - without it we cannot continue to work. We do not understand the reason for blocking the Humanitarian Centre. We have received no complaints. For two and a half years the Centre operated to fulfil Rinat Akhmetov's task of delivering aid. It was delivered, despite the shelling, and was distributed in line with every international standard of humanitarian assistance. And today, for the first time during the entire operation period of the Humanitarian Centre, the ordinary civilians – old people, women and children – cannot receive it.